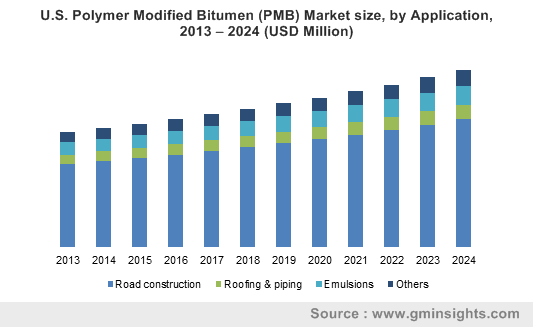 Polymer Modified Bitumen (PMB) Market Size was estimated over USD 9.5 billion in 2016 and the industry will likely grow by a CAGR more than 4% up to 2024. The mixture of bitumen with polymer helps to maintain the right consistency, strength and develop its visco-elastic behavior. Polymer help to increase the aesthetic properties and elasticity of the bitumen, thus making it more sustainable for different stresses. These properties fuel the PMB market demand in the infrastructure and construction industry. The cohesive strength and binding properties of the product makes it suitable for use in pavement and road construction activities. Polymer helps the bitumen to return to its original state after the vehicle pressure or weight is removed, thus increasing the overall road quality and durability. This also helps avoiding permanent cracks and deformations caused due to land pressure and heavy-duty traffic. Moreover, increasing number of road construction activities round the globe due to increasing vehicle usage and traffic is driving the polymer modified bitumen market largely. The price of a commodity is primarily dependent on the demand and supply factors of that particular product. Excessive oil production and exploration activities by many countries in recent years, coupled with depleting crude oil resources is the major factor for fluctuation in raw material prices. Bitumen is processed from crude oil and does not involve any cracking or thermal conversion. Depleting crude oil resources round the globe is one of the major restraining factor for the global PMB market. On the basis of product, PMB market can be segmented into three major categories, namely, thermoplastic elastomers, thermoplastic polymers, thermosetting polymers. Owing to the heat and UV rays resistance paired with superior elasticity, thermoplastic elastomers see huge industry demand in coming years with a major chunk of the overall PMB market share. The product is most commonly used component in the PMB market due to its superior qualities and relatively lower price. The thermoplastic polymer segment holds over a fifth of the entire PMB market share owing to its varied properties such as storage stability, temperature stability and rutting resistance. The product is comparatively less popular due to its inelastic properties, brittleness and high rigidity. The thermosetting polymers is sub divided into four sub-categories namely, epoxy, polyurethane, acrylic and phenolic resins. These resins have piacular properties and harden or solidify when heated or added with external hardeners. The PMB market application is bifurcated into three major categories which include road construction, roofing & piping and emulsions. Increase in the number of vehicle usage leading to traffic is fueling the needs for better and wider road construction in the developing countries. Rising disposable income of consumers in these economies coupled with spending on automobile is creating a demand for superior quality roads and better infrastructure. Also, heavy and bulky goods transportation is carried out through roadways on a large scale resulting in need for sustainable heavy-duty roads. Increasing population in the developing countries is demanding better housing, infrastructural and road facilities. Increasing standard of living paired with rising disposable income is allowing people to buy new homes and indulge into reconstruction activities using eco-friendly and superior quality material. Due to the waterproofing and cohesive properties exhibited by PMB, it finds extensive use in roofing and piping activities which helps prevent wall and ceiling wetness and leakages. Based on the region, North America holds over a quarter share of the entire PMB market owing to increasing use of vehicles and road building industry. The construction industry in this region is at a mature stage and will see growth at a sluggish pace in the forecast period. Presence of huge automobile industry players in this region coupled with a higher disposable income allows people to spend more on vehicles with superior features and quality. Asia Pacific is said to have one of the fastest growing PMB market owing to huge construction activities taking place in this region. Huge economies like China and India have a vast population with increasing GPD and purchasing power. Housing demand in these regions is growing over the past years resulting in new and enormous construction projects that are undertaken by the government and private players. These factors are driving the PMB market in the Asia Pacific region and will foresee potential growth in the coming years. Global PMB market find major players on regional and global levels. Key players in the PMB market include Tiki Tar Industries, Ooms Avenhorn Holding India Pvt Ltd., AMT Techno, Offshore Petrochem Pvt Ltd., MBD Industries, Maruti Group, Veekay Industries, L N Petro Chem, Lagan Asphalt Group Ltd, IKA group, Gulf Petrochem, Marini S.P.A., Royal Dutch Shell, The Richmond Group, Bitumat Compan6y Limited, South Machinery, Allied Bitumen Complex, Space Petro Energy Pvt. Ltd. (SPEPL), Ratnamani Industries, and RoadStar to name a few. It is difficult for companies operating in the European PMB market to sustain the market owing to huge competition from the major players. Shell, however, continues to grow and invest into its bitumen business in this region anchored by its two largest plants located in Netherlands and Germany. This is slowing down the activities for small players due to rising and tough market conditions. The shift in preference from using normal bitumen in the construction activities of road to use of polymer modified bitumen will propel the PMB market in coming years. The superior quality and low maintenance of the product will further push the polymer modified bitumen market to new heights in coming years. Commercial use of PMB is rising and will see immense growth opportunity in the developing countries. 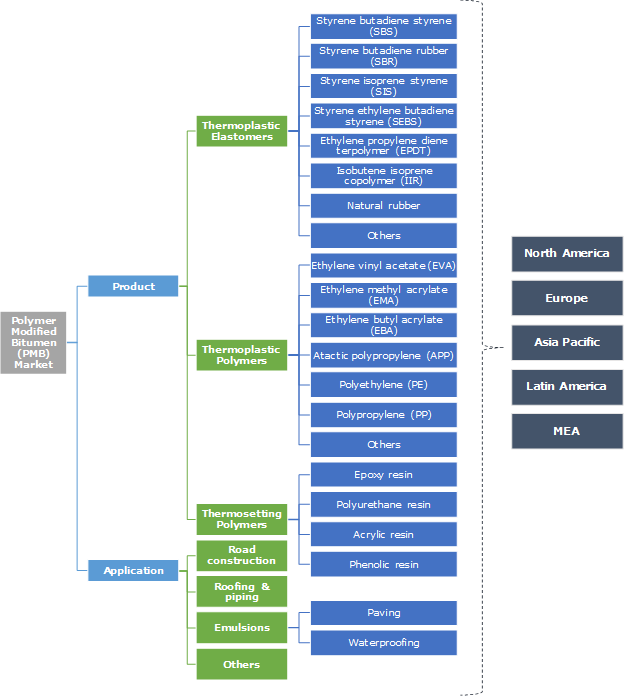 Companies in the polymer modified bitumen market are fragmented and are operating and dominating the industry due to rigorous competition. Companies in the global PMB market are located round the globe due to increasing oil extraction activities by many countries, which the primary raw material for PMB market. Crude oil extraction is the basic raw material for petroleum production, which is further used for the production of polymer modified bitumen. The PMB market will foresee potential growth owing to its superior quality cost effectiveness.